Can You Request A New Judge? It is stated in the law that both the State and the Defense have the right to a fair judge. This means that a fair and impartial judge must be made available to any parties under criminal litigation. A change of judge can then be requested with or without cause as needed. Whenever requesting a change of judge with cause, it must be stated in clear, full details as to why such request has been made as to ensure that it is still in line with the integrity and fair functions of the judicial system. This is a change of judge as a matter of right. This motion must be filed within ten days of the discovery that grounds exist for changing the judge. The requesting party must assure that such a request is only done in good faith. If the assigned judge does not agree that cause exists, the presiding judge provides a hearing on the matter before another judge to determine by the preponderance of the evidence whether a change of judge is required. If this judge rules that the change is required, the presiding judge will reassign the matter to another judge. 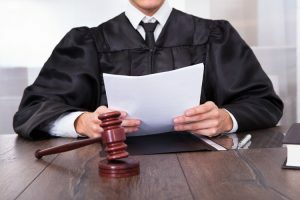 To obtain advantage or avoid disadvantage in connection with a plea bargain or at sentencing, except those allowed by Rules of Criminal Procedure. Furthermore, the right to a change of judge without cause is limited and controlled by also allowing both the State and the defense one, and only one, peremptory or final change of judge per case. A further exception of additional judge replacement might however apply if one side is made up of two or more parties under hostile or adverse interests. Once the request for a new judge is made, the case is transferred immediately to the presiding judge. The presiding judge reassigns the case to another judge.